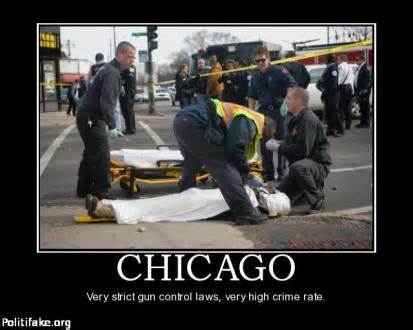 Hey #GunControlNow crowd, how’s that working in Chicago for their gun violence statistics? From MyFoxChicago: Three people were killed, and at least 7 were wounded, Saturday in shootings across Chicago, including a woman who was fatally shot in an attempted robbery in the Austin neighborhood. About 2:50 p.m., a 34-year-old woman was putting a toddler into her vehicle in the 200 block of South Lotus Avenue when someone walked up, tried to rob her and fired shots, Chicago Police said. A 30-year-old woman inside the vehicle was shot in the torso and pronounced dead at the scene, police and the Cook County Medical Examiner’s Office said. She was identified as Tierra Gonzalez, of the Northwest Side. The 34-year-old was shot in the abdomen and taken to Mount Sinai in critical condition, police said. The toddler wasn’t injured and was released to relatives. The shooter fled in a separate vehicle. Later in the evening on the South Side, a 22-year-old man was shot to death and a 17-year-old boy was wounded, police said. About 11:20 p.m., the two were standing in front of an apartment building in the 9400 block of South Wabash Avenue when someone fired shots. Stanley Watson, 22, was shot in his chest and pronounced dead at the scene, authorities said. He lived in the Back of the Yards neighborhood. The 17-year-old was struck in his back, legs, and right arm, and was taken to Christ Medical Center in Oak Lawn, where his condition stabilized, police said. Earlier in the morning, a man was shot to death, and two people were wounded, while standing in a parking lot in the Woodlawn neighborhood, authorities said. Two men, ages 26 and 33, and a 24-year-old woman were standing in a parking lot about 5:20 a.m. in the 6600 block of South Evans when someone approached and started shooting, police said. Kenneth W. Stanley, 33, was shot in his body and was pronounced dead at the scene, authorities said. The 26-year-old man was shot in his neck and left leg, and was taken in critical condition to Northwestern Memorial Hospital, police said. The woman was shot in her right bicep, police said. She showed up at the University of Chicago Medical Center, where her condition stabilized. Six other people were wounded Saturday in Chicago shootings, according to police.